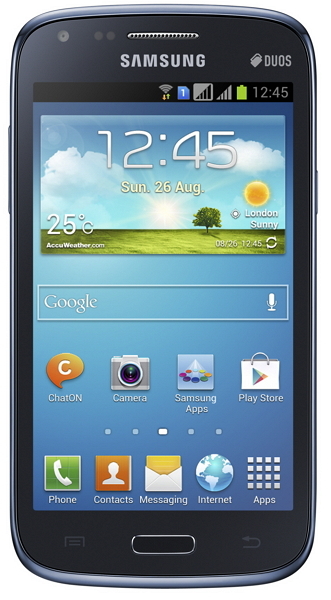 Samsung Mobiles now introduces new Galaxy core Android smartphone with dual SIM supports. The phone features 4.3-inch TFT LCD display with 800x480 pixels resolution. It comes with 5 megapixel rear camera with LED flash and 0.3MP front facing camera. The phone powered by 1.2GHz dual core processor with 1GB RAM and runs on Android 4.1 Jelly bean operating system. It has 8GB of internal storage memory and microSD option to expand the memory up to 64GB. The phone sports 1,800 mAh battery, for connectivity the phone supports bluetooth 3.0, WiFi, Micro USB. And also the phone comes with some built-in features such as Smart stay for save battery life, Smart Alert for Missed call and message alert to users, Motion UI for motion commands and S Voice for voice command functionality. The GALAXY Core will be available both Black and White colors and two different versions Single SIM from July or Dual SIM from May 2013. Price not announced yet, check back later for price updates.